Explanation: What's happening at the edge of the Sun? Although it may look like a monster is rampaging, what is pictured is actually only a monster prominence -- a sheath of thin gas held above the surface by the Sun's magnetic field. The solar event was captured just this past weekend with a small telescope, with the resulting image then inverted and false-colored. As indicated with illustrative lines, the prominence rises over 50,000 kilometers above the Sun's surface, making even our 12,700-diameter Earth seem small by comparison. 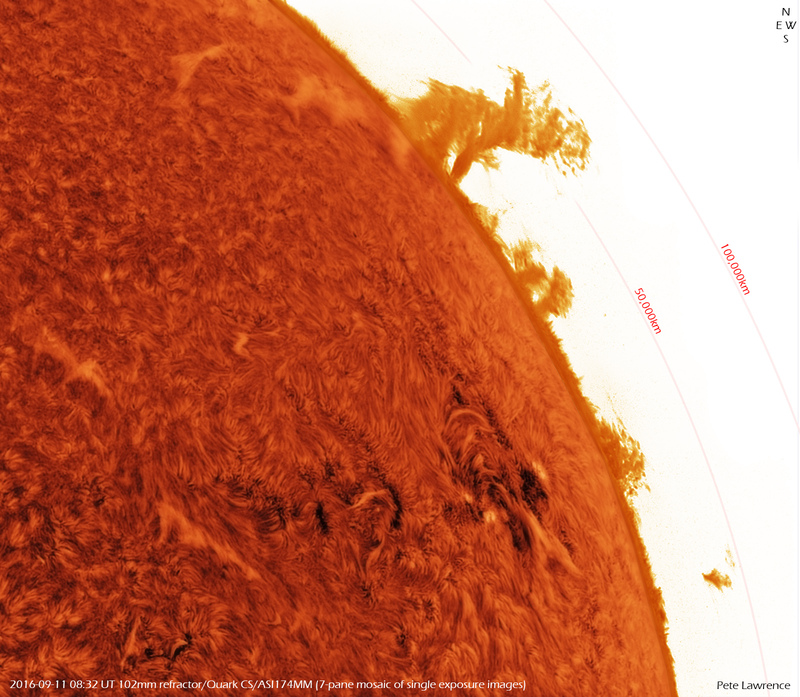 Below the monster prominence is active region 12585, while light colored filaments can be seen hovering over a flowing solar carpet of fibrils. Filaments are actually prominences seen against the disk of the Sun, while similarly, fibrils are actually spicules seen against the disk. Energetic events like this are becoming less common as the Sun evolves toward a minimum in its 11-year activity cycle.